We’ve just discovered that the CB industry organization IAAR (Independent Association of Accredited Registrars) created a self-paced online training course for CB auditors on the new ISO 9001:2015 standard that, one attendee reported, takes about three hours to complete. If only a few hours of training isn’t enough to convince you the CBs are preparing to unleash a horde of ignorant, unqualified idiots on the playing field, then consider this: the final exam is open book. What could possibly go wrong? Developed by IAAR and then accredited by both Exemplar and PECB, the IAAR course is being promoted to its members, who comprise a good number of the US-based registrars currently in operation, and where ANAB has a permanent seat. Many of the IAAR attendees are also on CASCO, the group that wrote their own auditing rules, and the IAF which decided not to require any special training for CB auditors at all. Here’s a copy of the marketing flyer for the IAAR training. If anyone gets a copy of the slide deck, shoot it my way. Not only is it easy, it’s cheap, too. 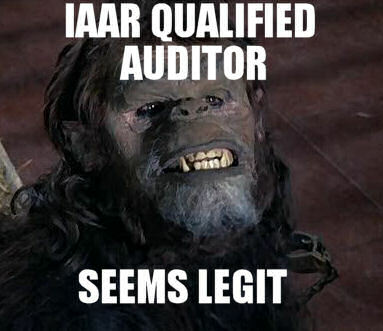 IAAR charges only $150 to become a sudden, overnight expert on all the changes to the standard. If you have the stones to skip the course materials, you can jump right to the exam for only $79. Do you think the low cost could be the result of the fact that IAAR members aren’t about to pay for their own lobby donuts, much less actual training of the people responsible for certifying organizations that make things like oil drilling rigs and automotive airbags? Hush, now. The offering was built by the members of IAAR being the registrars who provide certification to the Standard. This is unique in that the collective expertise of the industry has come together to create an online offering that satisfies their needs and that of their customers and accreditation bodies. What’s odd — or not really, given what we’ve seen so far — is that the course is actually aimed at ISO 9001 end users, and focuses on QMS implementation and maintenance. Both those subjects are off limits for CB auditors, but it’s being used to qualify CB auditors anyway. 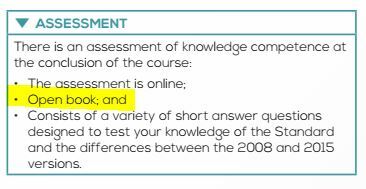 That means that of the three-hour course, perhaps only an hour of it actually covers material that would be pertinent to a registrar auditor. So no doubt your freshly-minted CB auditor-expert who only spent $150 on training will probably demand you attend some other Exemplar or PECB created event that costs upwards of $2,000 or you can risk a nonconformity. That’s convenient. If you’re not aware, the IAAR is a closed-door group of registrars that also includes a permanent presence from their chief benefactor oversight body, ANAB. No, standards users, you can’t attend IAAR events unless you’re a CB and a member. I think we may be in the only profession that requires a permanent, pre-recorded laugh track.